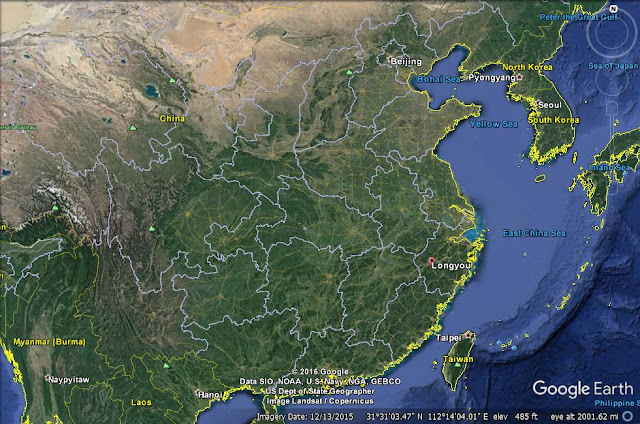 In China, in the province of Zhejiang, Quzhou prefecture, Longyou County, close to Shiyan Beicun Village lies a place called Phoenix Hill (see the map of China). In the area lie many very deep pools that have been called “bottomless ponds” by the locals for as long as they can remember. The residents use the pools to supply water for crop irrigation, drinking water and large numbers of fish, which are easily caught. In 1992, a local villager named Wu Anai, became unsatisfied with the legendary description of the ponds as bottomless. He somehow talked some of his neighbors into helping him rent an industrial pump. They pumped all of the water out of the nearest “bottomless pond.” They noticed that there were no fish or any other forms of life, unlike the other “bottomless ponds” that they knew. When the water stopped flowing from the pump, they went inside the gap in the rock. What they found was not what they expected. 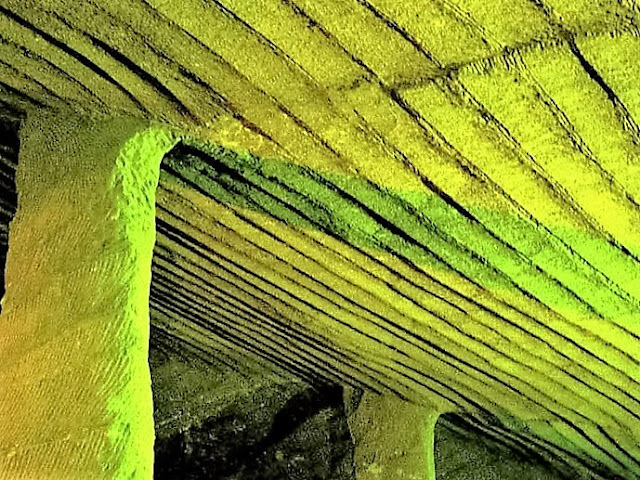 They found a massive cavern, carved out of the native sandstone, measuring some 98 feet deep (that’s the height of a 10-story building), expanding at the bottom to cover some 11,000 square feet. 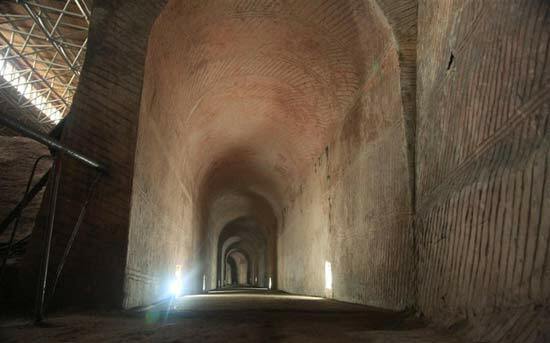 The roof was supported by massive pillars and the pillars, walls and roof were all carved out using a unique series of parallel bands, or courses, about 24 inches (a cubit and a span) in width. The chisel marks on the bands were consistently set at an angle of about 60° to the axis of the course. Finely crafted stairs and hallways led from the surface to the bottom of the grotto. Ornate, masterful carvings and symbols (none of which have been translated or interpreted) decorated the walls and pillars. The total area that is covered by the grotto is in excess of 11,000 square feet. 1. The total area covered by the known caverns is in excess of 320,000 square feet. That equals more than six and a half times the size of a football field. 2. 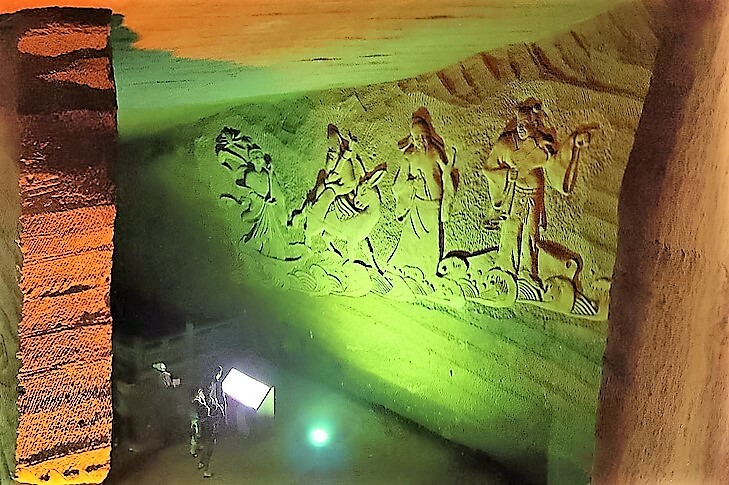 None of the overburden, the rock that was cut out to make these huge excavations, has been found. None. That’s a minimum of 6,400,000 cubic feet of rock. With sandstone weighing in at 150 lbs. per cubic foot, that’s at least 480,000 TONS (the equivalent weight of 240 medium sized American passenger cars) of rock that has simply disappeared. 3. The precision and skill of the builders is unfathomable. 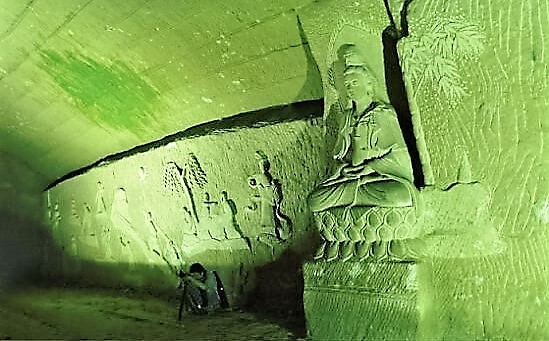 Using modern surveying and scanning equipment, the Chinese experts determined that, although many of the caves lay right beside each other, they were not interconnected, even though the walls between them were extremely thin. A single misplaced chisel stroke would have breached them and yet they never did so. The walls are all extremely regular and square and are of the same thickness in different sections. 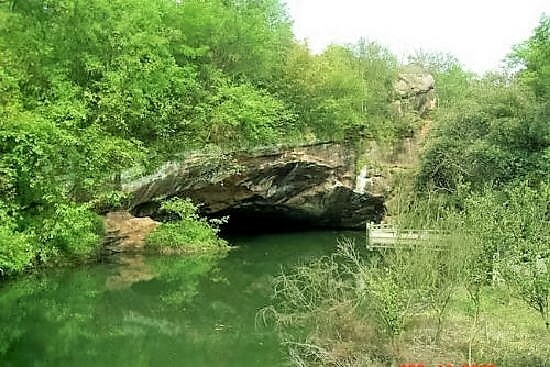 Yang Hongxun, of the Archaeological Institute of the Chinese Academy of Social Sciences reported, "At the bottom of each cave, the ancient [builders] wouldn't be able to see what the others were doing in the next grotto. But the inside of each cave had to be parallel with that of the other, or else the wall would be holed through. Thus, the measure apparatus should have been very advanced. 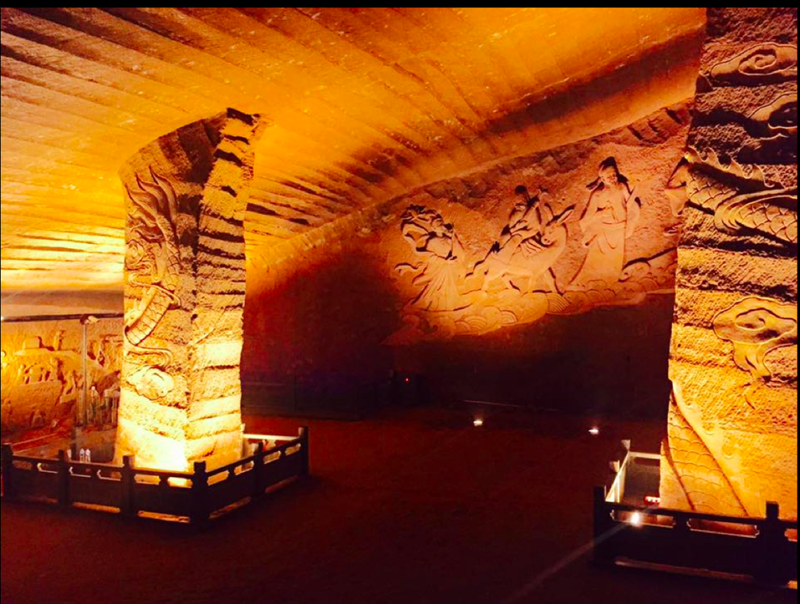 There must have been some layout about the sizes, locations, and the distances between the caves beforehand." 4. 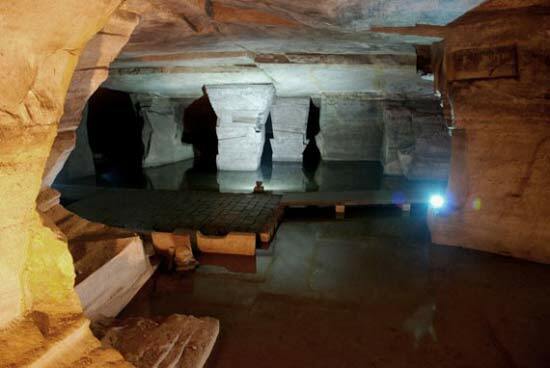 There is no discernible evidence of what these Brobdingnagian grottos were used for. They have no indication of being living spaces or arenas or storage spaces. What purpose could they possibly have had? 5. There is NO record of the building of these titanic works, or even of their existence, although the experts are claiming that they were built around 200 B.C. How they are determining this is beyond me, since you can’t date stone carvings except in very rare circumstances. 6. 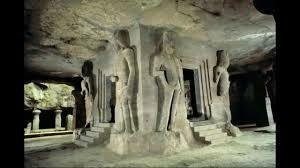 All of the caves are similarly carved and designed, obviously built by the same people. The fact that the carvings and symbols on the walls are unknown is significant in the light of the extensive historical information available about Chinese history. This is a significant fact because, as we’ve discussed before, Chinese written history is the most extensive and meticulously complete in the world. 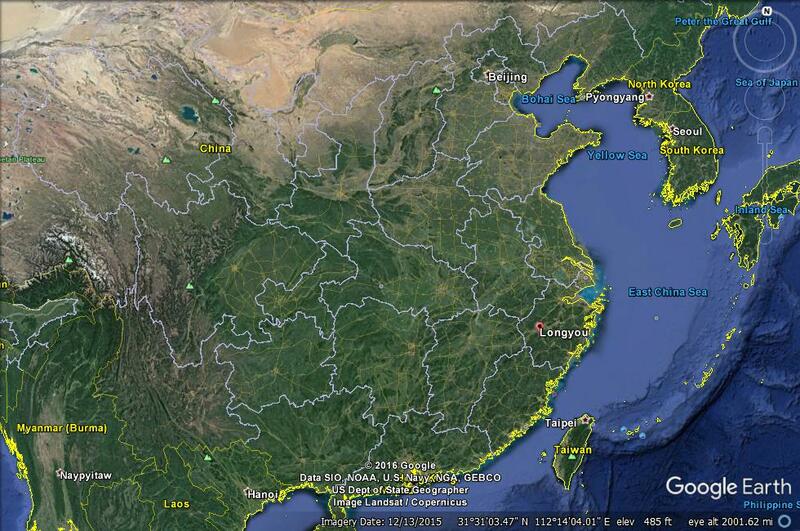 The Chinese have obsessively recorded everything that has happened to them in the last 6,000 years. This is great for historians, if misery for school children. I once had a Chinese friend tell me that, with 6,000 years of Chinese history, there is very little time for any other history to be learned. 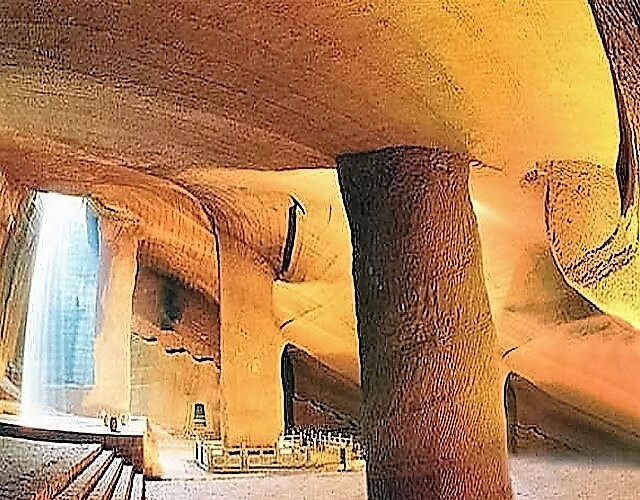 These massive grottos must have required epic time, effort and resources. That they are nowhere even mentioned in the extensive Chinese historical record is beyond credulity. Where does all this leave us and how does it apply to our own studies? Remember what our premises are. The superior environment that existed pre-Flood produced superior people with superior capabilities. These people lived for about 1,400 years before the Flood, developing a global, unified culture with advanced language, artistry and architecture. While they had certain advanced technologies, they did not need as many of them as we do because of their own maximized abilities. Most of the remains of these advanced cultural aspects were destroyed by the year long, world-wide Flood, but some traces still remain, if you are looking for them. With those premises in mind, what can we note about the example of the Longyou Caverns? 1. An unknown people left evidence that they existed before the recorded history of the oldest culture currently existing on the planet. Their engraved symbiology is outside anything that current historical science knows. 2. 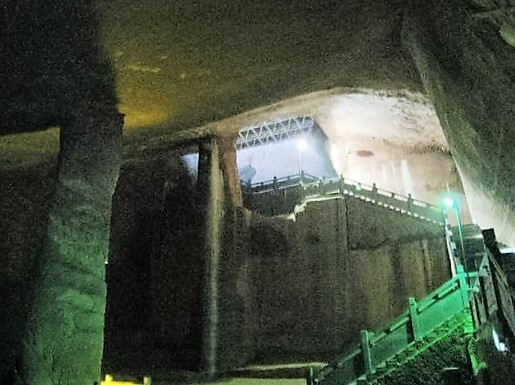 Those people were able to produce extensive and massive monumental works of profound and unreproducible technical skill and precision, nearly machine-like in nature (like the caverns of Derinkuyu, Turkey). 3. The same people were able to excavate and dispose of massive amounts of stone, leaving no trace whatsoever. Reference not only Derinkuyu, but the mountaintops that have been leveled off in the region of Nazca in Peru, also with no trace of the stone that was removed to produce the flattened surface. In summary, once again we are finding irrefutable evidence of an unknown people, with capabilities that can’t be explained, who carried out huge projects in the unrecorded past. These projects share marked similarities with sites located in various places around the world. None of this can be explained by the evolutionary, uniformitarian model of the post-truth academics. To the contrary, they are jarring refutations. In true science, if you have a theory that doesn’t cover all the available facts, you look for another theory that does. You don’t tailor the facts to suit your theory. Perhaps the real truth seekers among us should throw out the evolutionary model and look for something more utilitarian and fact based. Biblical creation science does that for me.